Yes, I am a Disney-fanatic at heart. But, let’s get this straight…I’m a Disney-LAND fanatic. I’ve been to both Disneyland and Disney World, and though I do appreciate what WDW has to offer in ways of hotel selections (Four Seasons Orlando and Golden Oak at Walt Disney Resort, come on! ), dining options (you cannot beat Epcot) and those Magic Bands (hello, Disneyland, time to get onboard! ), I just can’t let go of the nostalgic experience of the original Happiest Place on Earth. Every time I head to the park I learn about, and try something new and different I didn’t know from the last time. Our most recent stay introduced me to some primo experiences that made our trip feel truly luxurious this time around. And, yes, Disney + Luxury is a thing. 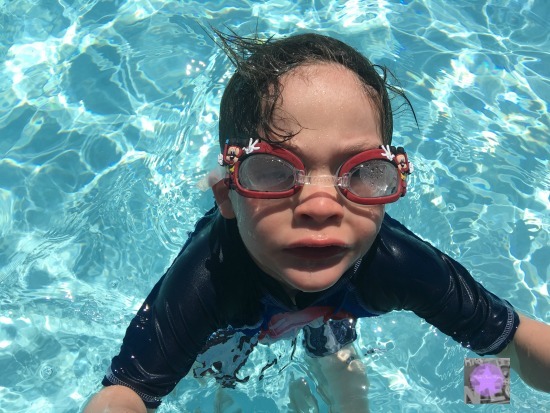 These activities might seem like a stretch, especially since it now costs a family of 4 around $1000 for 2-day park tickets with park hopper, but this is meant to be a luxury post, so let’s pretend the sky is the limit. 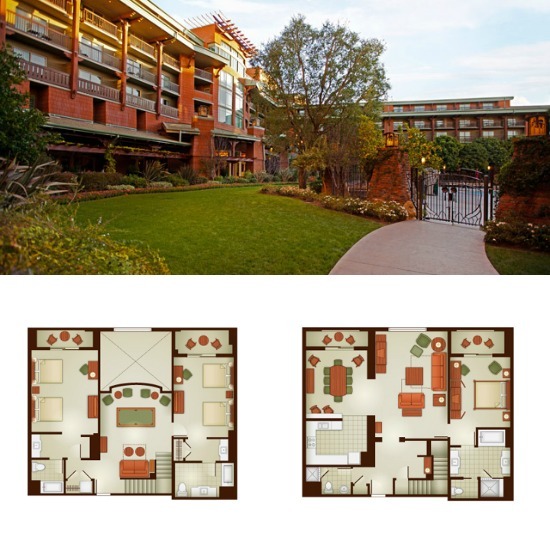 Stay…in a Disney Vacation Club 3-bedroom villa at The Grand Californian.The Grand Californian is the first and so far, only, resort at Disneyland to offer Disney Vacation Club Villas. The best and easiest way to have access to these desirable vacation villas is to be a Disney Vacation Club (DVC) member. We are not. Instead, we were invited guests of a Disney Vacation Club member. You can also have occasional access to the DVC villas without being a member- I am told it is possible, but quite pricey. This was the first time I have experienced a Disney Vacation Club villa. I was crazy impressed. A 3-bedroom villa fit my family of 6 and our friends’ family of 3 perfectly. Our villa’s floor plan offered an upstairs and downstairs which allowed for even more privacy between the two families, as we could easily access the upstairs (where my family stayed) without disturbing our friends below.The floor plan included a master suite with 1 king size bed downstairs; two bedrooms suites upstairs, each with 2 queen size beds and private bathrooms; two sofa bed couches (one upstairs, one downstairs); a full sized kitchen; dining room with table seating for 8; and a separate family room area with couches and TV. The loft area upstairs was located between the two bedrooms and included a billiards table (amenities are subject to change per villa and location) . Our DVC friends stayed in the room downstairs. Our 10-year old daughter and their 13-year old daughter stayed in one of the bedrooms with the 2 queens. Our 5-year old twins stayed with my husband and I in the other bedroom with the 2 queen beds. And, our oldest son, 12-years old, slept on the pull out couch in the loft with the billiards table. The amount of space and the amenities blew my mind that we could all fit comfortably, enjoying each other’s company while also having downtime. We were well-rested and relaxed during our 3-night stay. The beauty of The Grand Californian is the location in proximity to the park entrances, not to mention the direct access into California Adventure for hotel guests. The Disney Vacation Club Villas at the Grand Californian have a private entrance into the pool area of the hotel. The villa comes equipped with a coffee pot, oven, stove, refrigerator, microwave and pantry space making this a very lovely way to not have to rush in the morning, or to store leftovers, or to keep breakfast foods, snacks, etc., which helps on the budget end of things. However, if you’re not into dining in your villa, Downtown Disney with a Starbucks and some yummy eating options, is just a few yards away. 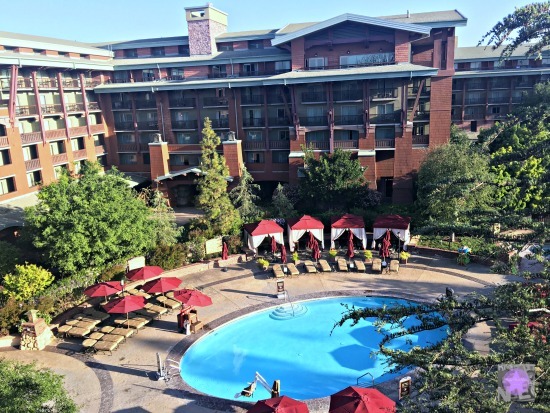 The Grand Californian also offers some fantastic amenities such as poolside cabana rentals for full or half day, childcare options at Pinocchio’s Workshop, and the Mandara Spa. Eat…at Club 33. 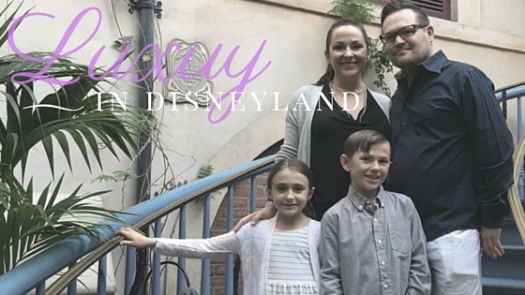 The only way you will get to experience this extremely exclusive restaurant hidden in the back alleyways of New Orleans Square inside Disneyland, is to either be a member of Disney’s Club 33, or know one. And, if you know one, be super nice to them so they invite you to dine with them at least once in your lifetime (it’s worth it, trust me). The meal itself is a sit down 5-6 course meal, and you can do a wine pairing. There is an extensive cocktail program as well, and one of the best mint juleps I’ve ever tasted (OK, so the only mint julep I’ve ever tasted, but it was damn good!) I would caution against bringing children under the age of 5 years to dinner. It’s a long, drawn out, yet enjoyable, process. We left our 5-year old twins at Pinocchio’s Workshop at the Grand Californian, at first much to my chagrin, but my husband’s insistence. For once, he was right. 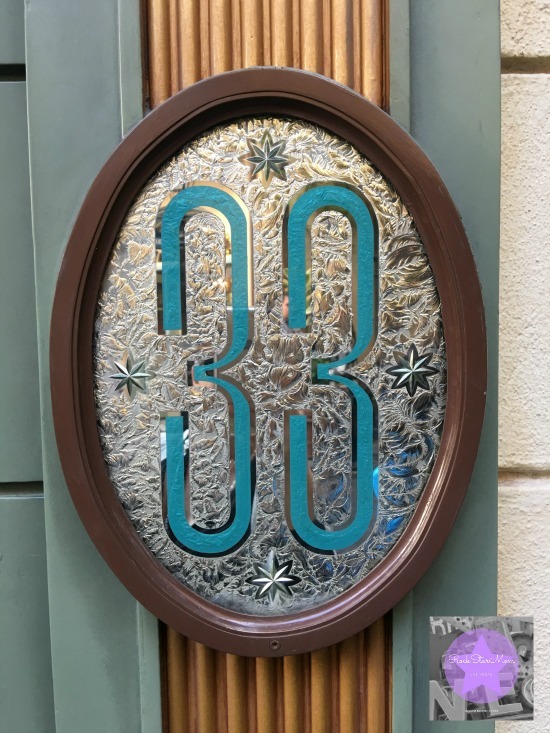 Club 33 is only at Disneyland Park. There is no other place like it in all of the Magical Kingdoms, including Walt Disney World. So, not only was this a once in a lifetime experience for us diehard Disneyland fans, but a truly unique one for our DVC member friends who were visiting from the East coast. 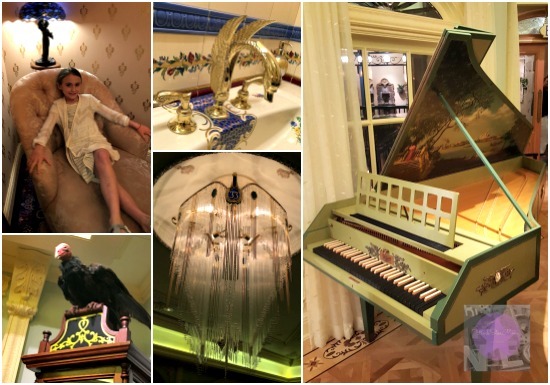 The dining room is beautifully decorated and filled with time-old treasures from both the Disney family and several different Disney movie sets. The newly renovated restaurant overlooks the Rivers of America, is upstairs above the Pirate’s of the Caribbean and next to Walt Disney’s Private Apartment (another property with exclusive access inside Disneyland). 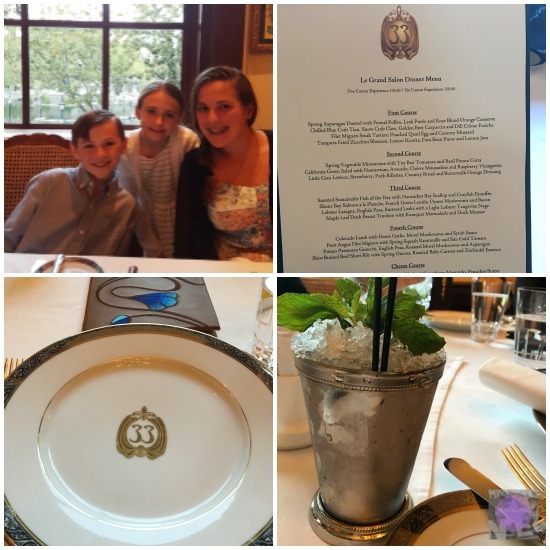 For a more detailed review of Club 33, check out my post on Luxury Travel Mom. 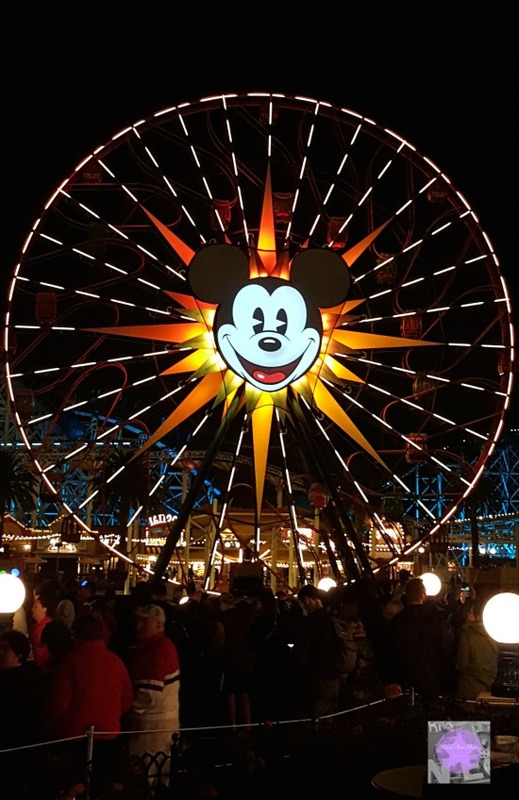 Watch…the newly revised World of Color Dessert Party in Disney’s California Adventure. If we are being honest, I always dreaded seeing this show, and, frankly, strayed away from encouraging anyone in my group from seeing it. Why? Literally, the worst seats in the world. The show itself, absolutely stunning and quite impressive. But, having to stand on cement for a minimum of 30-minutes to fight the crowds for a decent seat, is no easy task. Especially when the show only comes on at night, and my children are already exhausted from the day. There is no way they are going to sit that long without crying or hanging on me or fighting with each other. So after we saw it once, we were good. I always wondered why there was no other option for seating and viewing like the wonderful VIP area at Fantasmic (not currently showing due to structural changes happening in the Rivers of America for the highly anticipated Star Wars Land). I’m telling you, honestly, again, if I want to see a show like that, I will pay for seats. And, so will my husband (definitely something we have in common that strengthens our marriage). When we heard about the new World of Color Dessert Party, we happily raised our hands and grabbed our tickets. We have been wanting to see the revamped version of the show featuring Neil Patrick Harris as the MC, and this was the perfect way to introduce our friends (the DVC members from the East Coast) to another unique Disneyland experience. For $79 per person (including children ages 3 and up), you are seated at a high-top cocktail table, and served delicious desserts, elegantly plated on china. The tray is per person as well- as in every person who pays $79 gets to indulge in a sweet and savory selection of desserts, including a Dulce de Leche-filled cookie, Mickey Coconut Macaroon, a selection of fruit and artisanal cheese, just to name a few. Adults can indulge in sparkling wine, and sparkling cider will be available for guests under 21 years of age. 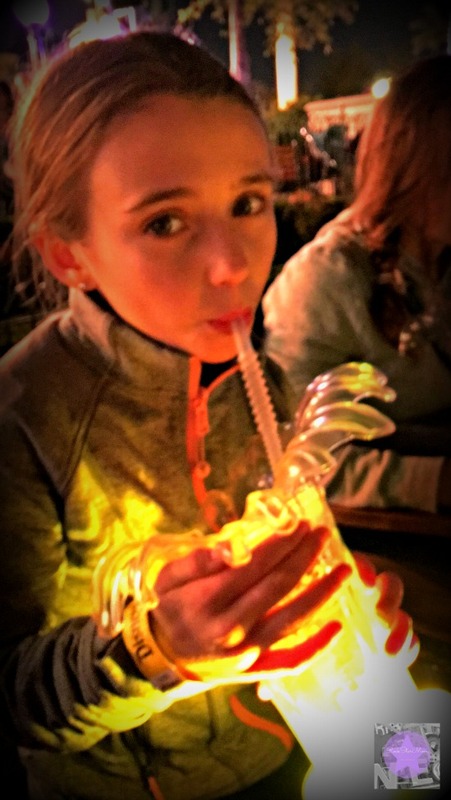 But forget the sparkling cider for the kids…go big and order the punch that is served in a fun water fountain shaped glass that glows in conjunction with the lights during the show. My children were fascinated, mesmerized, and engaged while I got to sit in a seat for 30-minutes sipping my glass of sparkling wine, and no one was hanging on me. The cups are included in the price (menu items are subject to change). By the way, that $79 per person includes tax and gratuity. Reservations are highly recommended. Make yours by visiting Disneyland.com/dine or calling 714-781-DINE. 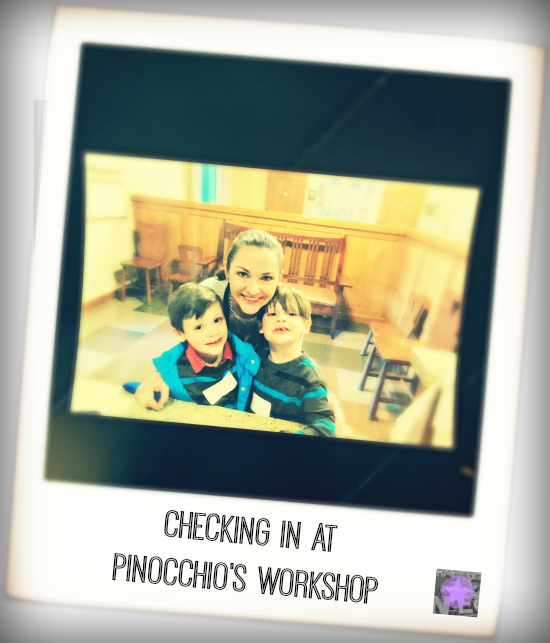 Enjoy…a night out without the littles by dropping them off at Pinocchio’s Workshop at the Grand Californian. Exclusively offered to hotel guests, Pinocchio’s Workshop is a licensed care facility that provides onsite care services for children 5-12 years of age from 5 pm to midnight (for a fee). 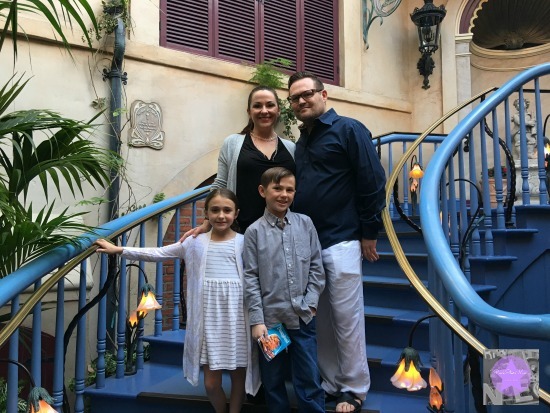 It was money well spent for this once in a lifetime opportunity to dine at Club 33. 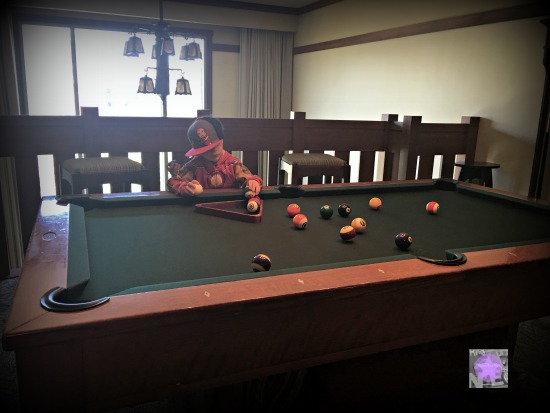 As I mentioned, my husband gently suggested that we look into taking advantage of the childcare services offered at the hotel we were staying at, the Grand Californian. 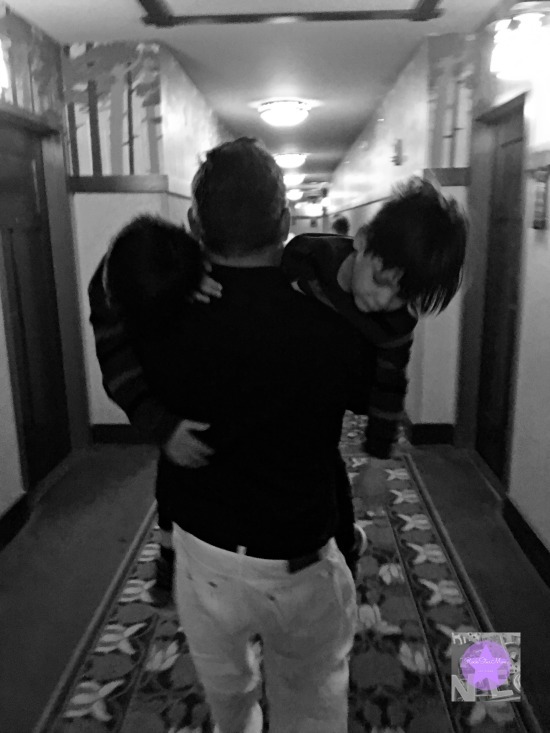 I was not totally comfortable with leaving my precious littles alone in a room with an adult stranger where my two older siblings were not around. I became more open to his suggestion once I discovered Pinocchio’s Workshop. This truly was a lifesaver. 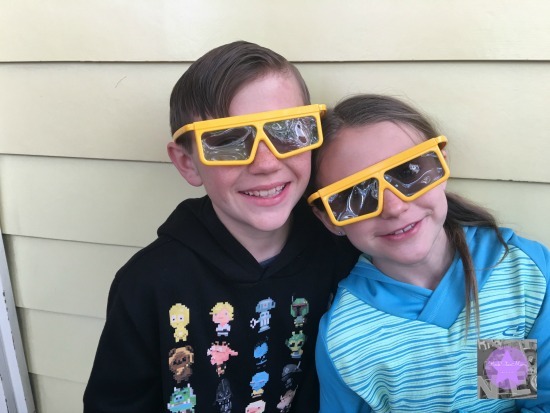 Even though I had it in my mind I was still taking the twins with me to Club 33, by the end of a very full day at the parks, they were super tired and begging me to have chicken fingers and go to bed. They were thrilled with the notion of Pinocchio’s Workshop. I didn’t even have to bribe them. We took a brief tour of the options available for them in the play space: lots of movies, air hockey, board games, crafts…they were in before I could give them a hug and a kiss good-bye. The staff is very attentive and also very conscientious about the safety of the children. I had to fill out forms upon forms with phone numbers, allergies, emergency contacts, doctor’s numbers, etc. They took my picture with the kids to assure I would be the only person allowed to pick them up. There is even a dinner menu (for a fee) where the boys ordered exactly what they wanted: spaghetti with butter and French fries for one, and chicken fingers with fruit for the other. And, I’m pretty sure they enjoyed that dinner way more than they would have the one offered on the children’s menu at Club 33. When we came to pick them up, they were the last two kiddos left, and were passed out comfortably on the oversized beanbags in front of the TV. It was a total win/win for all of us, and made the night so much more enjoyable, especially for my older children. OK…so all of that will put a rather sizeable dent in your wallet during your stay at the Disneyland Parks and Resorts. Want a luxurious tip that costs you nothing? Have your souvenirs delivered for free to your Disneyland Resort hotel using Package Express. Yup, FREE. It’s a long standing service, but one I always forget about. We actually used it this time, as the kids wanted something from the Toy Story Midway Mania store, and there was no way I was coming back that way yonder again after we left. A very easy thing to do…ask your sales person to make it happen. Show them your room key, they will fill out a form, you give them your Disneyland Resort hotel info and voila, you’re on your way without another bag to weight you down. You will feel like a serious VIP. Disclaimer: This trip was personally fully funded, excluding the World of Color Dessert Party in Disney’s California Adventure, which was a media invite. All words, thoughts, opinions 100% my own. Loved the Story. We are also huge fans of Disneyland. The kids looked like they had a great time.